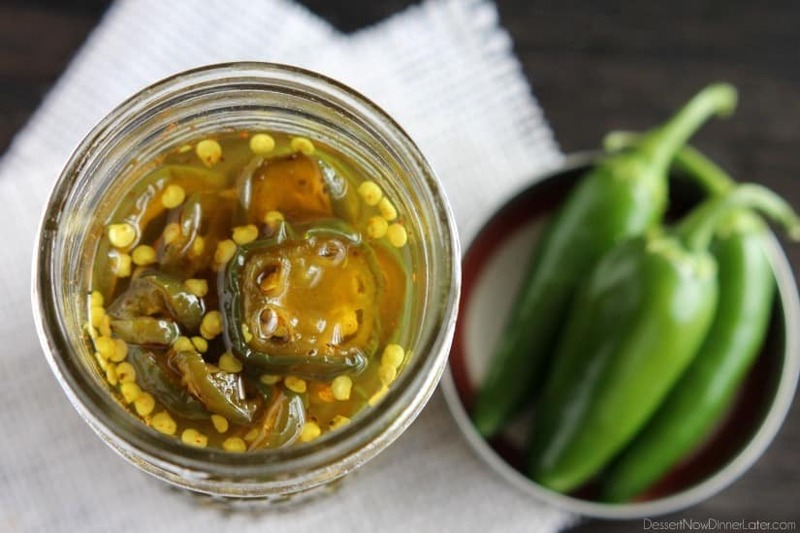 Candied Jalapeños - Dessert Now, Dinner Later! 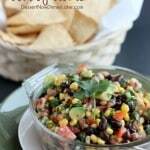 Every year we grow jalapeños in our garden just to use them for this recipe! 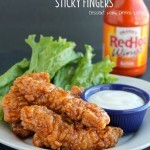 My husband is addicted to all spicy things, so he eats these like potato chips! A while back Applebee’s used to have a spicy burger that had candied jalapeños, which is where my husband first tried them, and once he tried that burger, he was hooked and we’ve been making candied jalapeños ever since. What are candied jalapeños? They are jalapeños that you slice and pickle like you would beets or other things – lots of sugar and some vinegar with spices. Some people even call these beauties Cowboy Candy. They’re sweet with lots of heat! My husband likes to eat these candied jalapeños on burgers, nachos, or over some cream cheese on a cracker! Really, you can put them on anything, if spicy is your thing. You are going to love them! *Be sure to wear gloves or wash your hands thoroughly after preparing the jalapeños; do NOT touch your face or eyes. Remove and discard jalapeño stems, scoop out and throw away any seeds, depending on your heat tolerance, then slice each pepper into uniform ⅛ to ¼ inch rounds. Set aside. In a large pot, bring cider vinegar, sugar, turmeric, celery seed, garlic powder, and cayenne to a boil. Reduce heat and simmer for 5 minutes. Add the pepper slices and simmer for 4 minutes. 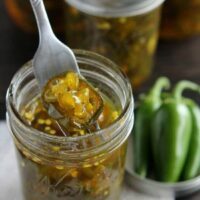 Use a slotted spoon to transfer the peppers into clean, sterile canning jars, packing the jalapeños semi-firmly within ¼-inch of the upper rim of the jar. Turn heat up under the pot with the syrup and bring to a full rolling boil. Boil hard for 6 minutes. 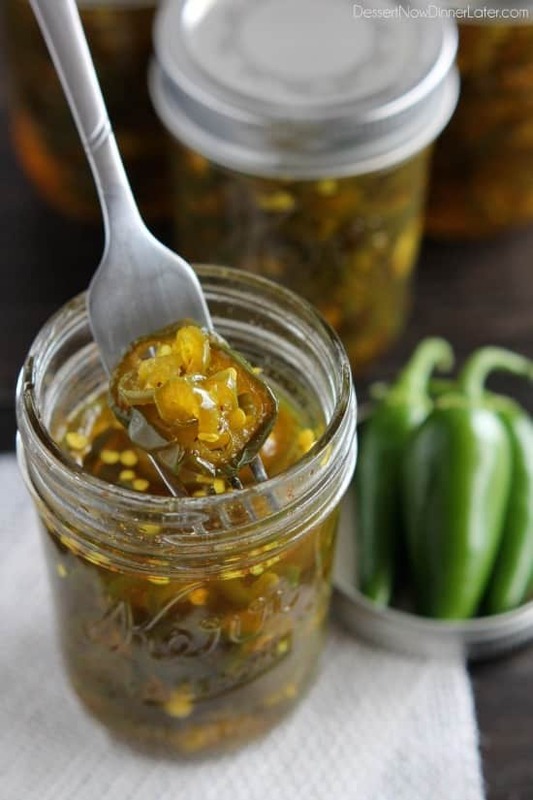 Use a ladle to pour the boiling syrup into the jars over the jalapeño slices. Insert a plastic knife to the bottom of the jar two or three times to release any trapped pockets of air. Adjust the level of syrup if necessary. (*If you have leftover syrup, it's a great marinade for meat! Don't throw it out!) Wipe the rims of the jars with a clean, damp paper towel and fix on new, two-piece lids to finger tightness. If you do NOT want to can these to the point of shelf stable, simply cool jars at room temperature for an hour and then store them in your refrigerator. To can, place jars in a canner and cover with water by 2-inches. Bring the water to a full rolling boil. When it reaches a full rolling boil, set the timer for 10 minutes for half-pints or 15 minutes for pints. When the timer goes off, use canning tongs to transfer the jars to a cooling rack or kitchen towel. Leave them to cool, undisturbed, for 24 hours. When fully cooled, wipe them with a clean damp washcloth, double check that they've sealed properly, then label. My husband also loves all things spicy. He puts sriracha and jalapenos on everything. These candied jalapenos look like something even I would enjoy! Yum! Nice! I will eat these with the cream cheese topped crackers, but only a few, they are sweet, but the heat gets me! I’m a wimp! Wasn’t it Jalapeno Jelly or something like that? I’m not a jalapeno lover, but Kyle will eat all the jalapenos anywhere! Oh I love these! Can’t wait till my kitchen renovation is done so I can finally bottle a few necessities like these! Pretty pictures! Thanks for your compliments Laura! Hope the kitchen renovation goes well! 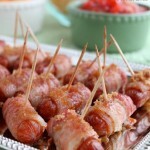 I have reposted your recipe with the picture as th a t is how I found it on Pinterest . The recipe sounds wonderful . May I have your permission to leave this on my canning and preserving board ? The ingredients list automatically generates from the rich pin, but if you have the directions in the description, I would kindly ask you to remove that so pinners can come to my site for the full information. Thanks for double checking! Oh wow! I’ve never done them with red jalapeños! I bet they do look really pretty! Thanks for sharing! Amber…I have these cute jelly jars with red and white checkered lids, if I don’t can, can I use these jars and store in fridge like you explained, they have the twist on lids! I was making these for Christmas baskets! I’m actually pretty lazy when it comes to canning, so we just store ours in the fridge for a few months, but my husband usually eats them pretty fast! The jars you explained should work just fine! Enjoy! Amber help my peppers are so hot, what did I do wrong they are not sweet like cowboy candy they have been in fridge 2 days!! Do you think it was my peppers! LOL and I doubled the recipe! I did pick huge, fat one! Oh no! Shucks! The bigger the pepper, the more seeds it has. I’m sorry! I will edit my recipe to caution future readers to remove some seeds depending on their heat tolerance. You can try putting them back on the stove with some more sugar until it dissolves. 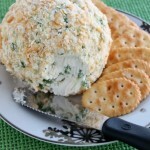 Serving them with cream cheese on crackers should help with some of the heat as well. Sorry! Not a problem, I thinking that too! I’m wondering if I drained them and put new liquid back in them! I knew I should have gotten the skinny ones LOL! I will let you know what happens! I’m not the best cook but I’m addicted to these I love them! That sounds like it could work. I hope you get it figured out! Just follow the recipe as explained. The longer the flavors marry in the jar the better they get, but you can even eat them after they cool down. I haven’t tried this with red peppers. You’ll have to let me know how they turned out! If i don’t process these in a canner how long will they last? I would say 1 month. FYI on the storage. I made these last June (2015) and didn’t can them but stuck them in the fridge with a lot of other condiments I was making at the time, and promptly forgot about them. I found them again last May, and they were absolutely delicious. Now I’m back for the recipe to make more, and I doubt I forget them this time! Note that I did not use garlic or cayenne. Mine were blow-your-head-off hot, but oh, so good. I saw that your husband fell in love with Apple Bees candies jalapeño burger. I also fell in love with it and then it was gone and it was very sad lol. Till this day I ask them to put the jalapeño on it like before and they look at me like I’m crazy and bring me out a burger with fresh jalapeños on it. Thank you so much for sharing this recipe. Next time bring your jar of homemade candied jalapeños and you are all set! I hope you like the recipe! Just learned to can this July, & have made this recipe several times already. Have requests for some as Christmas presents, too. I mixed the sauce with mayo for a sandwich spread. Tasty! I think the sauce could also be usec as a starter for homemade barbecue sauce. That’s so great! I love your ideas to use up the sauce! Thanks Barb! I diced these up before storing them more like a relish, great on anything from burgers to chips, etc. The whole batch lasted two days only. Time to double up the recipe. Perfect! I’m so glad you liked them Christopher! Thanks for your comment! Hi Deb! After these are processed they are softer like a cooked vegetable. Hope this helps! Is the cowboy candy recipe NCHFP tested for WB canning ? Thanks ! I’m not sure. I got this recipe from someone else and I can’t find anything besides pressure cooker instructions on their website. I’ve been meaning to leave a reply for a while now. I found this recipe on Pinterest, and I’ve made these at least 4 times in 1 year! They turn out crunchy, snappy, and almost “candied”. I was worried about the amount of sugar and so little liquid, but myyyyy myyyyy these sweet and spicy little thangs are PERFECT! Everyone loves them. Thank You SOOOOOO much for sharing this recipe. Amber do you think I could use Apple Cider Vinegar? Thanks, my mouth was watering just reading the instructions. Yes! That’s actually what I mean by cider vinegar. I’ll have to fix that to be more clear. Sorry about that! I made these and the left over syrup I saved but put in the fridge. It is now a solid brick…. once we open a jar of the jalapeños and place the jar in the fridge will it become a solid brick??? It should not have done that. I wonder if it hit the hard-crack stage like in candy making. 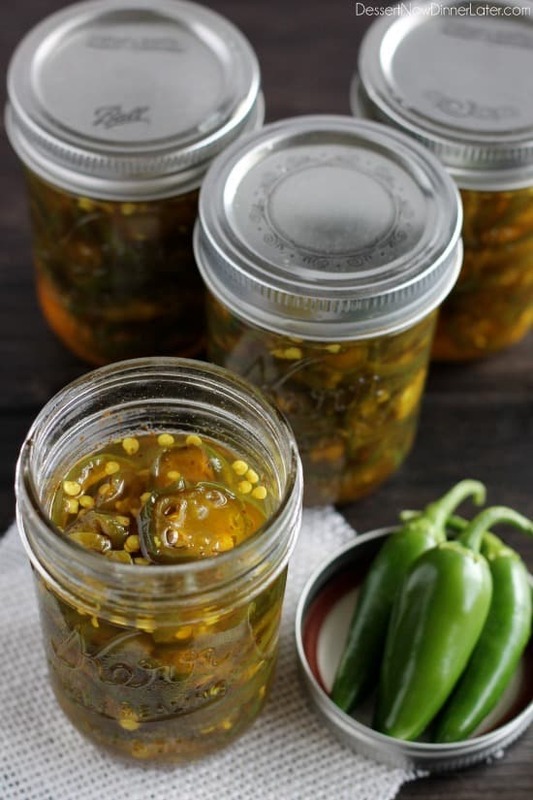 Maybe after you open a jar, transfer the jalapenos to an old plastic container just in case. I’m sorry that happened. We’ve never had that problem before. I love this! I buy peppers in the grocery that also have Rum, Vodka and Tequila added. Do you think that could be added to the finished product without harm? Hi Nikki, I’ve never canned with alcohol. You might be able to do it with a small batch if you aren’t planning on actually canning it. You’ll have to google it. From what I can find, most alcohol burns out with canning and evaporates, so you may want to just add it afterwards and then store everything in the fridge for a month or two. I used 1 1/2 pounds. The size of the peppers may effect how many fit in the jar.